These are the four words that define my life's passion of music and what i instill into my students.I started learning cello when i was 11 years old, and my middle school orchestra teacher helped set the groundwork for my love of music. My high school years were heavily involved in creating music, and constructing the arrangments of the music i loved while growing up and helped build the basics of my music career. While attending Winthrop University,i learned the skills needed to teach students which led to my journey as an educator. 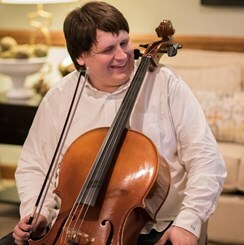 I also learned how to advocate my love for music through volunteering with the local middle,high schools as well as the Union Symphony Orchestra.Now im looking to inspire my students to love music by not only teaching them cello and violin, but music theory and musical arrangement and being able to express themselves by composing and understanding music is much more than ink written on a piece of paper.